Manufacturer & Exporter of Anderson Windows. Our product range also comprises of Windows Frames, UPVC Window and UPVC Doors. Anderson windows are popular in the market, owing to their impeccable designs, weather resistance and dustproof properties. 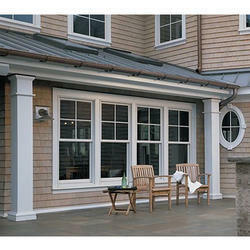 We are offering Anderson Windows to our clients. inwards hinged at the side. This is by far the most common type of window in Germany, its country of origin. It is also widespread in many other European countries. The turn property (i.e. swing in) function of the window allows easy cleaning of the outside panel as the entire pane can easily be accessed from inside. Therefore there is no need to climb ladders or clean from the outside. The tilt function gives excellent indirect ventilation. That is any draughts are directed upwards and so there is a more constant airing. 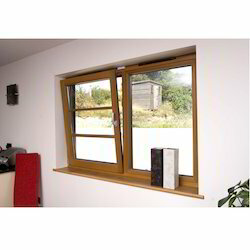 If more ventilation is required at any time than is allowed by the tilt function then the window can always be fully opened using the other method of opening. The operation is very easy with both opening functions operated by a single lever. The UPVC Tilt and turn windows are also very secure with the entire perimeter locked into place by the single lever. This style of window is a good combination of medical styles and modern technologies and is extremely versatile.